1. 1 The Hybrid Displacement Boundary Element Model This work is concerned with the derivation of a numerical model for the solution of boundary-value problems in potential theory and linear elasticity. It is considered a boundary element model because the final integral equation involves some boundary integrals, whose evaluation requires a boundary discretization. Furthermore, all the unknowns are boundary vari- ables. The model is completely new; it differs from the classical boundary element formulation *in the way it is generated and consequently in the fi- nal equations. A generalized variational principle is used as a basis for its derivation, whereas the conventional boundary element formulation is based on Green's formula (potential problems) and on Somigliana's identity (elas- ticity), or alternatively through the weighted residual technique. 2 The multi-field variational principle which generates the formulation in- volves three independent variables. For potential problems, these are the potential in the domain and the potential and its normal derivative on the boundary. In the case of elasticity, these variables are displacements in the domain and displacements and tractions on the boundary. 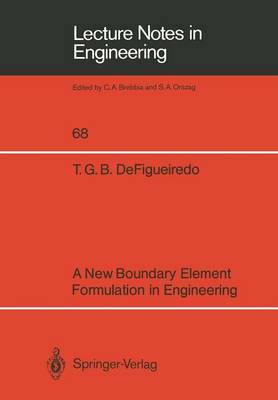 For this reason, by analogy with the assumed displacement hybrid finite element model, ini- tially proposed by Tong  in 1970, it can be called a hybrid displacement model. The final system of equations to be solved is similar to that found in a stiffness formulation. The stiffness matrix for this model is symmetric and can be evaluated by only performing integrations along the boundary.